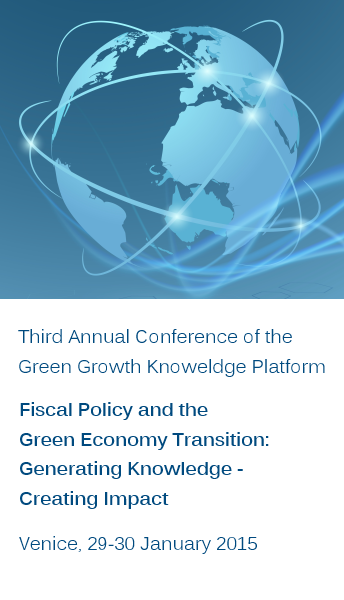 The Green Growth Knowledge Platform (GGKP) held its Third Annual Conference on the theme of "Fiscal Policies and the Green Economy Transition: Generating Knowledge – Creating Impact". The conference, hosted in partnership with the Ca' Foscari University of Venice, The Energy and Resources Institute (TERI) and the United Nations Environment Programme (UNEP), was held at the Ca' Foscari University of Venice from 29-30 January 2015. What role is there for fiscal policy in the transition to a green economy? 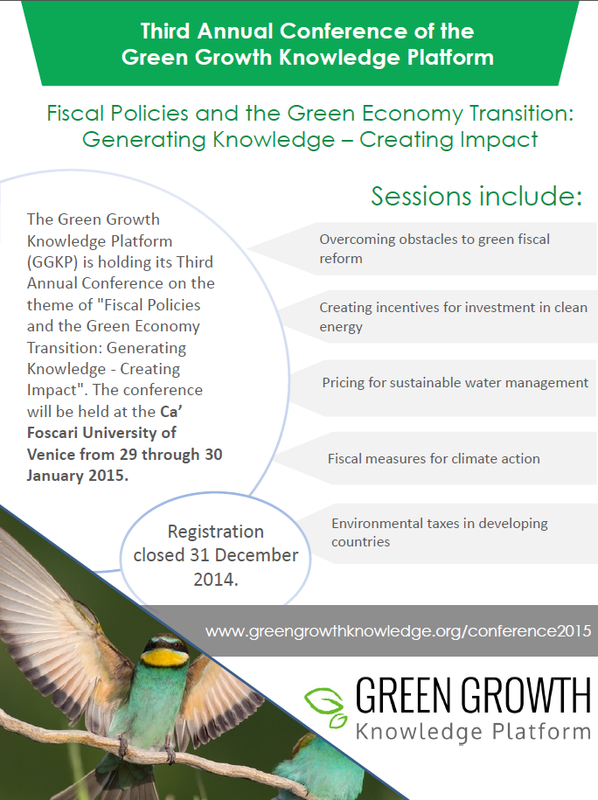 The Third Annual Conference of the Green Growth Knowledge Platform represents a new kind of conference. A hybrid between a policy and academic conference, it drew together these two communities to jointly discuss and debate the efficacy, geographical applicability and policy implications of various fiscal instruments in the transition to a green economy. The conference aimed to explore cutting-edge research, identify lessons learned, and promote innovative thinking around fiscal policy, as well as to identify knowledge gaps to catalyse further applied research. Over two days, participants engaged in a mix of plenary and parallel sessions, jointly debating the most effective means of introducing and implementing green fiscal measures in various national contexts. Information on the Conference Review Committee, responsible for the academic content of the conference can be viewed here. The GGKP Annual Conference took place at San Giobbe, part of the Ca'Foscari University of Venice. San Giobbe is located in Cannaregio, one of the six historic districts of Venice. Details on the conference poster session are available here. Download the full list of participants here. This high-level panel discussion sets the scene and provides an overall context for the GGKP Annual Conference by triggering debate on some of the unexploited potential of existing tax systems and other structural policies to foster green growth. This session focuses on how countries can design effective green tax reforms to reduce tax burdens, address social concerns and have a positive environmental impact, with case studies on environmental fiscal reform, carbon taxes and recycling schemes. This session highlights opportunities for increasing investment in renewable energy and energy efficiency, including the appropriate choice and design of instruments to address market barriers, strategic subsidies and household behavior. This session explores how green growth policies in the water sector can address issues of both quantity and quality by encouraging water-related innovation and investment in green infrastructure, with a specific focus on institutional entrepreneurship, water tariffs and environmental surcharges. This session examines how to overcome obstacles to green fiscal reform focusing on the use of mitigation measures for vulnerable firms and low-income households, complementary measures for carbon taxes and political implications. This session shows how effective green policy reform can succeed where other economic models have not and should be considered an integral part of the drive towards eradicating poverty; specific research focuses on carbon pricing, the distributional effects of energy policy and fiscal policy in Indonesia. This session explores how new technologies and the widespread deployment of existing green technologies can contribute to sustainable development; specific examples focus on optimal energy transition pathways and the impact of uncertainty on innovation. This session highlights the potential for fiscal instruments to reduce environmental impacts from the transport sector, including congestion, air pollution and waste; specific examples focus on taxes, feebates and effective car scrapping schemes. This session highlights a range of fiscal measures that can be used to address climate change, with a specific focus on reform of the EU Emissions Trading System, macroeconomic effects, and examples from green fiscal reform in the Netherlands. This session explores the options for water pricing and how they can contribute more substantively to the sustainable financing of water resource management functions; specific examples focus on water pricing and security in urban and rural areas. This session illustrates how behavioural, social and technological changes are crucial components of any green growth strategy; specific research focuses on the acceptance of environmental policy and the adoption of technology. This session examines how economic incentives can shift consumption and production patterns regarding biodiversity-based goods and services; specific examples focus on ecological fiscal transfers in Brazil, adaptation expenditures and applications to the Convention on Biological Diversity. This high-level panel explores the broader framework in which green fiscal measures are deployed. More specifically, panellists will discuss the tools and fiscal instruments available to governments to identify, implement and fund efficient and feasible low-carbon trajectories. This session focuses on how subsidy reform can be crucial for moving towards a more sustainable development path; specific research focuses on the impact of subsidies on carbon emissions and investment as well as the distributional impact of energy subsidy reform. This session discusses the strengths and weaknesses of green fiscal reform including a proposed framework for assessing effectiveness, research on the net effect of fuel taxes on global emissions, and fiscal instruments being used in Asia. This session explores the use of fiscal instruments to mitigate and adapt to climate change; specific examples focus on carbon permit trading between the EU and China, and linkages between climate policy, pensions and public finance. This session explores how environmental taxation can be an efficient and effective way to promote green growth in developing countries, with specific case studies on green tax schemes from South America, Namibia and Vietnam. This session discusses the need for complementary policy options to drive innovation and investment in clean technology; specific examples focus on renewable energy in OECD countries, wind power in China and the global adoption of fluorescent lamps. This session focuses on different ways policymakers can stimulate the transition toward a carbon-neutral economy, with specific cases studies on climate change public expenditure, the Republic of Korea’s Green New Deal and California’s Cap-and-Trade program. This session examines different instruments that can be used to promote sustainable and more inclusive growth, with specific research that focuses on environmental fiscal reform, trade in green goods and services, and partnerships. In this final high-level discussion, panellists will reflect on the key ideas to emerge from the conference, with a focus on how to further a global agenda on fiscal policy in support of a green economy transition. They will also discuss lessons learned, knowledge gaps identified and ways to better promote collaborative and coordinated research. Special edition of the GGKP "Insights" blog, "Why fiscal policy matters for a green economy transition", by Dr. Carlo Carraro, Dr. Suneel Pandey and Dr. Steven Stone, organizers of the GGKP's Third Annual Conference. The blog presents thResearch highlights from the GGKP’s Third Annual Conference – Q&A with Debashis Chakrabortye case for using fiscal policy to achieve economic, social and environmental goals - highlighting examples in the energy, water and transport sectors and outlining the challenges which exist in practice.